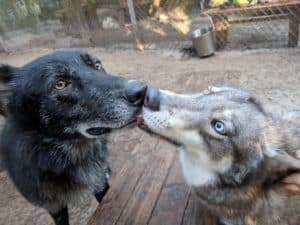 Welcome Belle and Kiya to the Shy Wolf Family! “Singers” are a wild canine native to Papua New Guinea off Australia. They were first discovered and classified as their own species by a man named Hallstromi (Canis hallstromi) but later were reclassified as a subspecies of the dingo. Currently, taxonomy is still unclear but generally they are considered to be Canis lupus dingo hallstromi (or familiaris) or Canis dingo hallstromi. The original pair went to a zoo in Australia and it is widely thought that most captive bred Singers trace back to this pair. Recent DNA studies are indicating that the Singers very likely pre-date the Dingoes and may be their ancestor or from a common shared ancestor. There’s still a lot to figure out and all of our Singers are contributing to the research! We first heard about “Bonnie” as a Singer posted for sale on CraigsList in Alabama. She was bought from an exotic pet sale to be a backyard breeder. The owner wanted $500 even though she no longer had a male to breed with and the dog was in horrible condition. 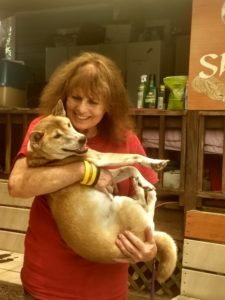 She absolutely refused to surrender Bonnie to rescue, so Singer lovers and a couple of groups dedicated to rescuing and preserving them got together to raise the funds, enough was donated to purchase her and pay for veterinary care. A veterinary technician experienced with Singers went to pick Bonnie up and realized how horrible her condition was as she had an extremely high fever and serious infection of her mouth going all the way to her sinuses. An emergency vet visit, extensive dental work, lots of TLC and prayers helped her on the road to recovery. Shy Wolf had committed to providing a safe place for Bonnie, thinking that she’d be a good companion for Melbourne. Given her fragile health and extensive dental work, this no longer seemed like a good option…besides, Bonnie had come to love being indoors during her rehabilitation. A new plan was needed. That’s when our Education Coordinator Theresa Schultz and her husband Jay offered to try fostering her, as long as she got along with their other two rescue dogs. We’re very happy to report that fostering lasted about 15 seconds! Jay and Theresa plan to adopt Belle (renamed for her new life) and spoil her like she deserves! Belle is going to be one of our main ambassadors, educating lots of people and children about this very unique wild canine who sings a beautiful song. She’s finally found her voice again and is already busy remodeling her new home and stealing her brothers’ beds. In October of 2014 Shy Wolf Sanctuary was contacted by individuals concerned about the welfare of a young wolfdog being offered for placement or rescue. The owner had purchased the dog from a known breeder prior to being diagnosed with a serious medical condition which required her to move into her daughter’s home. Kiya was being kept in one room due to the daughter’s dislike of large dogs and had somehow escaped in June. While out, the young pup was hit by a vehicle and had two broken legs. The person who contacted us had seen photos of Kiya with an old beat-up surgical cone and duct tape leg dressing and was very concerned the dog would lose its leg. Due to the sensitive nature of this rescue, and needing to get the dog surrendered by the owner, two of our more experienced volunteers agreed to go evaluate the situation and condition of the pup. As prior adopters, they both had a great deal of experience with wolfdogs and were able to win the trust of the owner. Our volunteers were able to win the trust of the owner and get her to release Kiya to them. Their first stop was to a veterinarian to get Kiya’s legs x-rayed and to determine how to proceed. The story was one of serious neglect. One leg had been surgically repaired while the other was poorly splinted by the owner using duct tape. Kiya lived in a house full of smoke and had to go to the bathroom in the one room she lived in. She hadn’t even had a bath in the months since the vehicle accident. With all that Kiya went through, it is no surprise that she had a confidence issue. No matter what our volunteers did, she always preferred being outside and they had to “win” her trust over again and again. Circumstances changed and the sanctuary had the opportunity to introduce Kiya to one of our residents. She wants to be outside, wants to play, and is overall a happy and loving girl. It was a huge success and Bogie became Kiya’s new beau…with them sharing the foot tub and running and laying all day at the sanctuary!